Does Scotland Have the Remotest Pub on Earth? The screaming parking-lot attendant sprints toward us to yell this out, moments after a baboon snatched an apple from our car, cried out and scurried off into a nearby tree. This must happen a lot, I think to myself. Our travelling companions that day were a Vancouverite food-truck maven and her partner, with whom my girlfriend and I shared a table at the rooftop bar of the Grand Daddy Hotel on touristy and lively Long Street. After perhaps one too many Castle Lights and Savannah ciders, they convinced us to cancel our rental car and pile into their Westfalia the next day to “jam on south” to the end of Africa and Cape Point. The following morning, after a quick brunch at Lazari in Vredehoek, off we went. 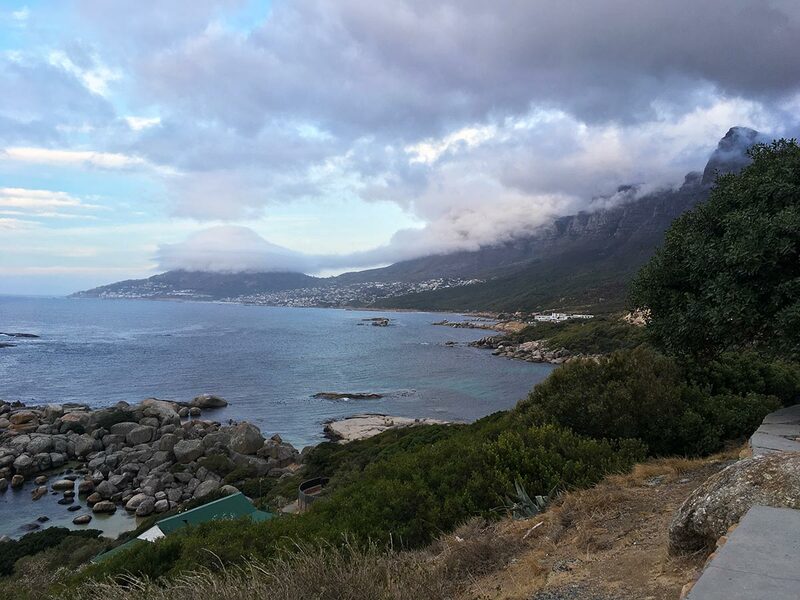 The drive takes approximately two hours—we opted to cruise south on the Atlantic side of the cape, with higher ground providing spectacular views of the Silvermine plateau and seaside towns dotting both sides of the sandstone cape. Table Mountain, Cape Town’s “new” wonder of the world that forms the Mother City, is the highest point and end of the same rock formation, dividing the oceans and rising out of the water up to a kilometre high. 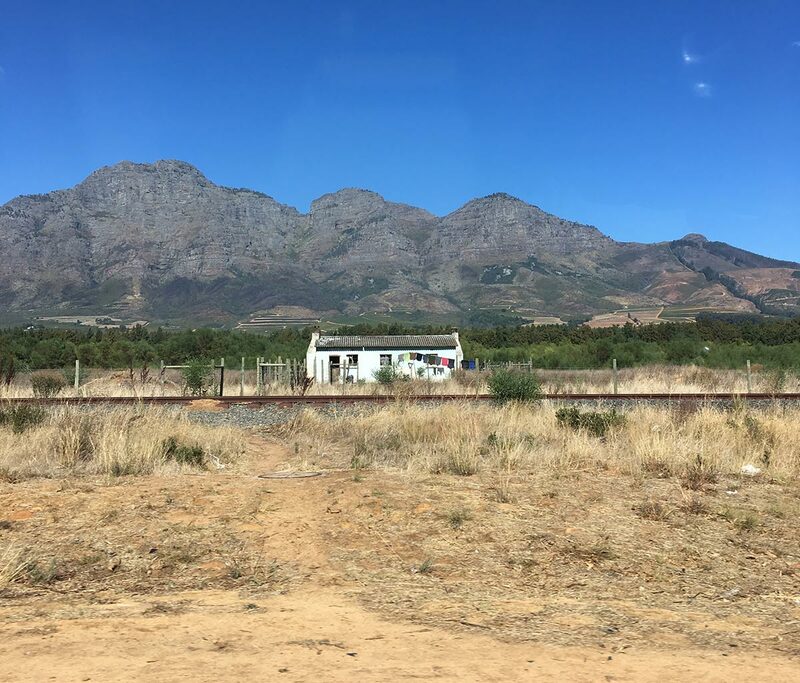 As we drove, ostriches sprinted alongside the van on a ribbon of highway aimed straight at the two oceans—a breathtaking view that hit us hard as we raced toward the end of the southern hemisphere. A 19th-century home at the end of Africa. Well, basically the end. 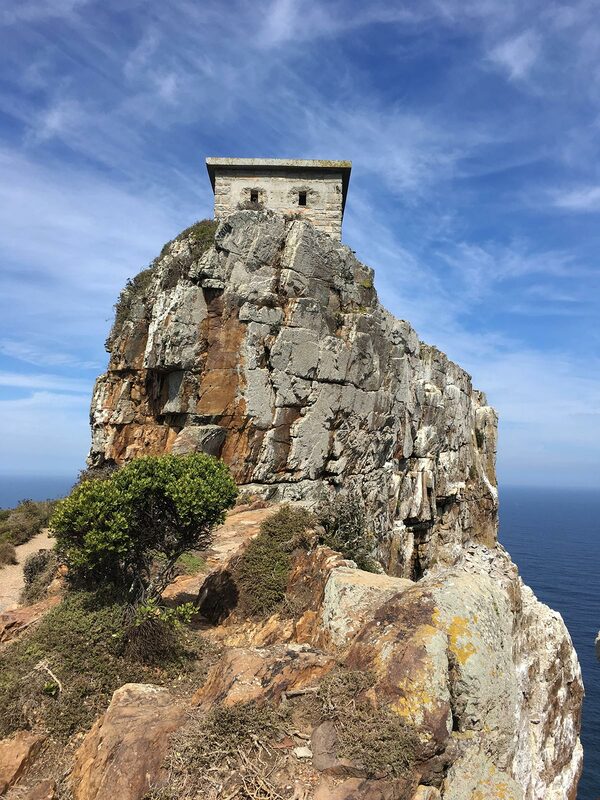 Contrary to popular belief, Cape Point and the Cape of Good Hope are not the southern tip of Africa—there’s another, longitudinally more southern cape about 150 km to the east. Our destination was, at least, where the Indian and Atlantic oceans meet, which still felt monumental enough to warrant a day trip. After entering the national park, which costs 135 rand per adult—about as expensive as a decent meal at a restaurant in Cape Town—the mountains flatten dramatically into rolling meadows, teeming with lush vegetation and grazing hyrax and ostrich. We’d seen so many breathtaking views from the car so far, and we hadn’t even gotten to the ocean yet. Since we were four hungover Canadians, our van was filled with snacks—chips, cape fruit and biltong (African-style jerky) of many stripes. We’ll find out soon this is perfect baboon bait. The parking lot was teeming with cyclists and tourists; it was easily the busiest place we’d been to in South Africa. But it wasn’t uncomfortable. Beware the baboons: They’ll eat your food. Suddenly, while stretching from the drive, we see the first one. A quiet little guy, sauntering on his hands and feet across the parking lot, looking totally comfortable among humans. He’s kind of cute, actually. Then, like a flash, he darts. Toward our car. Our van sits there innocently—the door is open, snacks all over the floor—protected only by a Vancouverite absent-mindedly sunscreening himself in its shade. Someone yells “Baboon!” and our hero bursts into action. The baboon’s head is suddenly inside the car; the sunscreen bottle hits the ground. The monkey turns, confused. “YAAA,” shouts the human, flinging his foot in the direction of the animal, who has let out a horrific shriek of its own. Teeth bared—big, sharp, gnarly, terrifying teeth—it’s ready to fight when the attendant runs up. In the commotion, the beast slips away, gripping an apple that he snagged from inside one of our bags, several feet from the door. I don’t know how he got in there, or why he ignored the several bags of chips. Maybe he eats local. 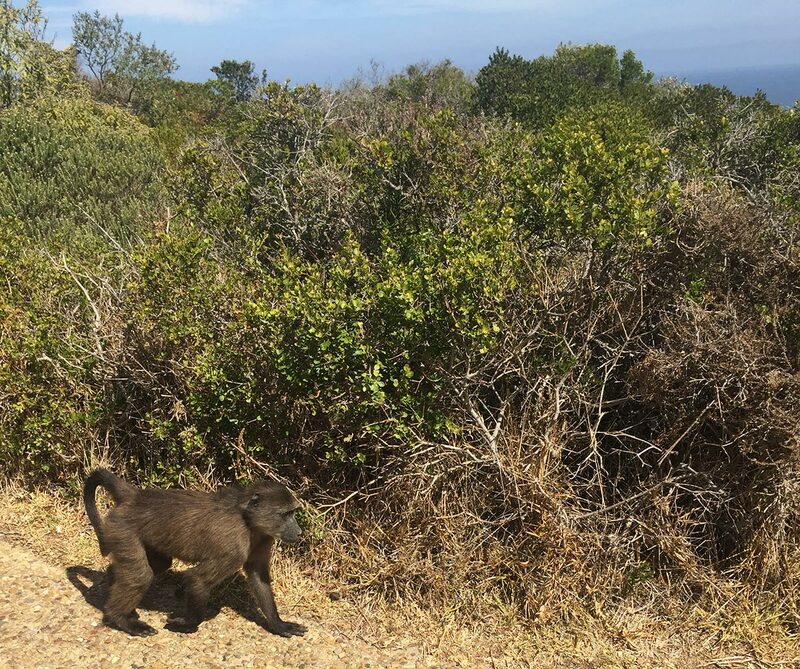 After a shaky and adrenaline-filled hike to the point itself, skeptically side-glancing at the several dozen baboons who line the path and glare at all human comers, we head back to the city. On the coast of the cape. We return on the Indian Ocean side, through the fishing villages of Simon’s Town, Kalk Bay and Fish Hoek. We stop for some hake and chips and eat among the colourful houses near the beaches around Muizenberg. Then we’re back in the car for a drive north through Cape Town, past the wine farms of Constantia and across the mountain for stunning clifftop views of the Welsh beach town of Llandudno, to the chic Camp’s Bay and clubby sea point, heading back to our hotel downtown. A day of beauty, adventure and the battle between man and nature, complete. According to legend, the ghost of the Flying Dutchman ship is doomed to circle False Bay near the Cape of Good Hope for all eternity. Honestly, that’s a purgatorial fate I could live with. Gabe is a traveller, marketer and audience-growth guru. He currently lives in a van.